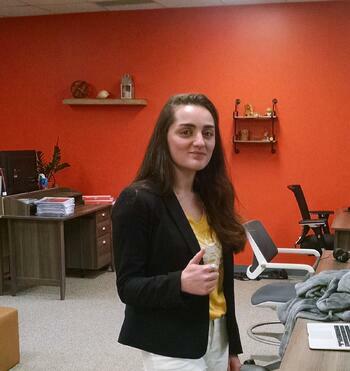 Recapping our First Internship Program in the Shark Tank! For those of you who don’t know, over the past 10 years, ManoByte has grown from a solo entrepreneurial venture to a thriving business equipped with a team of 15 marketing professionals. We’ve moved locations several times to offset the growth of our team, and in recent years, we’ve even launched an in-house video studio to better service our clients. Despite all those additions, last spring we noticed something was missing from our growth journey… a ManoByte internship program! So, we created one, and it rocked our socks off. 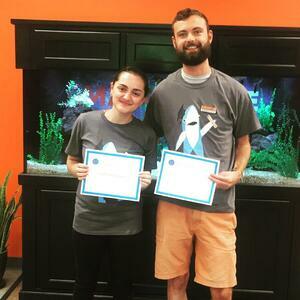 This summer we’ve been honored to welcome two awesome college students into the Shark Tank for the summer months, and they have blown us away with what great additions they’ve been to our team. MB: Tell us about yourself and your education. GF: I'm a digital marketer by day and beekeeper by night. Thanks to ManoByte, I am now a graduate of the digital marketing program at Ferris State University. MB: What do you love about interning here? GF: The people I work with are amazing. Not only are they extremely talented, but they also are supportive and always willing to help. There is also a chocolate jar that is never empty! Even when your schedule's tight, there's always time for a community chocolate break. MB: What surprised you about your internship with us? GF: What surprised me the most was how willing everyone is to help you. I thought it was going to be a sink or swim scenario, but I couldn't have been more wrong. MB: What was the biggest thing you learned? GF: To pinpoint one big thing would be impossible. I learned such a diverse skill set while working here. I was encouraged to learn new things, from content writing to Adobe Creative Suite. MB: Anything else you’d like to add about yourself and your internship with us? GF: The culture at ManoByte is one of my favorite parts. I've never worked at a place where I fit in so well. I'm usually the weird one, but at ManoByte, everyone's weird! I love it. JD: I started my computer science career while attending community college at North Central Michigan College in Petoskey. At the time, I had no idea what I wanted to do or anything about computer science, so I spent a few years bartending while I was going to school. I knew I needed to make some career decisions, and since I have always been into video games, technology, and math, I began gravitating toward computer science. I decided to take a basic class in programming and logic at NCMC, and I was hooked immediately. 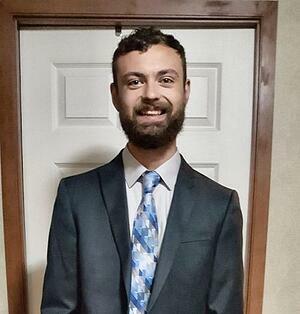 Soon after, I made the decision to attend GVSU to work towards my bachelor’s degree in computer science. I couldn’t be happier about that decision. JD: I love the freedom at ManoByte. The privilege to take on development projects is invaluable and so helpful in learning the trade. I love not being the intern who mainly sits around doing nothing, or going on coffee runs for the office. It’s great being an important part of what ManoByte is creating. MB: How has this experience shaped your future? JD: It has solidified my interest in web development, specifically. Coming into the internship I knew I enjoyed web development, but there are so many other paths in computer science to take as a career. This was the most real-world experience I could have asked for regarding a web development career, and I thoroughly enjoyed all of it! JD: I would like to thank everyone at ManoByte for the opportunity and the experience! It has been a rewarding experience and would recommend this company to any computer science student interested in a web development internship! Although the internship is over, we are also very excited to announce that both Gabriella and Justin will be sticking around for at least a little while as we work through some big projects here at ManoByte.